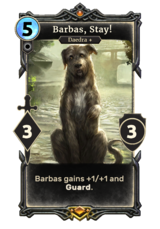 Barbas is a unique legendary Neutral creature card. It is part of the Heroes of Skyrim expansion. 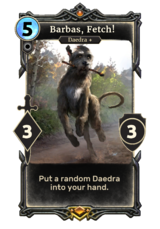 Put a random Daedra into your hand. Barbas gains +1/+1 and Guard. 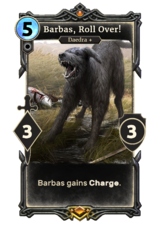 Barbas gains Charge. "Yeah, I just talked. And am continuing to do so." "You aren't my master. But you'll do for now." "I know, wars to fight, dragons to confront..."
Barbas first appeared in Daggerfall, and later reappeared in Redguard, Oblivion, Skyrim, and ESO. 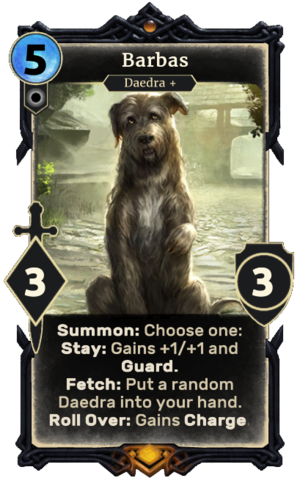 The card depicts him as he appeared in Skyrim. The card's creature type was originally solely Beast. This was changed to Daedra in Patch 1.66.0. The Beast subtype was added alongside Daedra in Patch 1.68.0. "Skyrim is now host to giant, flying lizards and two-legged cat-men... and you're surprised by me? Yes. I just talked. And am continuing to do so." "You are exactly what I was looking for." "I know, I know... Wars to fight, dragons to confront, guild business to conduct. Listen, when you're ready to do something useful, find me outside Haemar's Shame, in Falkreath."